Finding your next client dead at her home is not the best way to start a business... that's why Lacy Marie Crocker’s will ask for help at her NOLA PD homicide detective "friend" Jack Oliver. When someone starts following and threatening Lacy, she can't say no to a handsome police detective to protect her or her new two kittens Cashmere and Cotton! This is one of those books that everyone could be the murderer, even the less suspicious one! 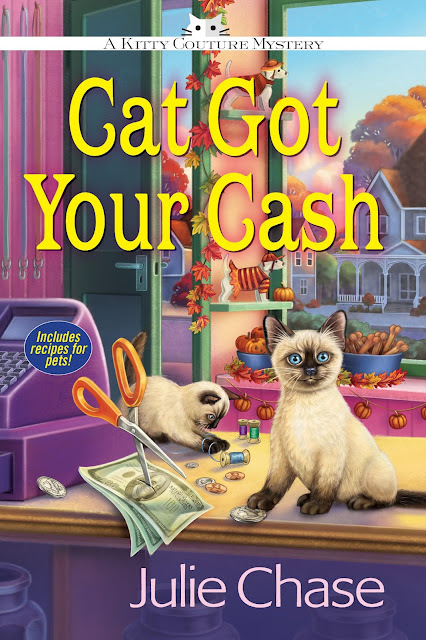 Funny, with a few twists and a little dust of love Cat Got Your Cash is the perfect book for a long weekend! I really enjoyed this book, the main character Lacy is funny and of course has a lot of problems (if not we wouldn't be reading this book!) but she has really good friends ready to help her in their unofficial investigation, even her own pets try to help her! I don't have any pets living with me right now, but I love them and it was nice knowing that you can make your own treats at home, the recipes that Julie Chase had created seem yummy, and I am sure are more healthier than the snacks you can buy at any shop! You will find some recipes at the end of the book. 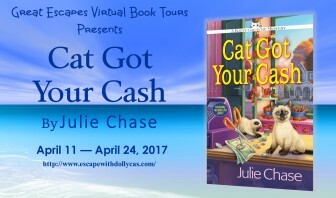 This is the second book of the Kitty Couture Mystery series, you can not miss the series, they are great! What do you prefer, the cat or the cash?